Article 2 of Brazil's Constitution defined the roles of both the Emperor and the Assembleia Geral (General Assembly or Parliament), which in 1824 was composed of 50 senators and 102 general deputies, as the nation's representatives. The Constitution endowed the Assembly with both status and authority, and created legislative, moderating, executive and judicial branches as "delegations of the nation" with the separation of those powers envisaged as providing balances in support of the Constitution and the rights it enshrined. The prerogatives and authority granted to the legislature within the Constitution meant that it could and would play a major and indispensable role in the functioning of the government—it was not just a rubber stamp. The General Assembly alone could enact, revoke, interpret and suspend laws under Article 13 of the Constitution. The legislature also held the power of the purse and was required to annually authorize expenditures and taxes. It alone approved and exercised oversight of government loans and debts. Other responsibilities entrusted to the Assembly included setting the size of the military's forces, the creation of offices within the government, monitoring the national welfare and ensuring that the government was being run in conformity to the Constitution. This last provision allowed the legislature wide authority to examine and debate government policy and conduct. Map of Rio de Janeiro, then Neutral Municipality and capital of the Brazilian Empire. National Archives of Brazil. Regarding matters of foreign policy, the Constitution (under Article 102) required that the General Assembly be consulted about declarations of war, treaties and the conduct of international relations. A determined legislator could exploit these Constitutional provisions to block or limit government decisions, influence appointments and force reconsideration of policies. During its annual four-month sessions the Assembly conducted public debates. These were widely reported and formed a national forum for the expression of public concerns from all parts of the country. It was frequently a venue for expressing opposition to policies and airing grievances. Legislators enjoyed immunity from prosecution for speeches made from the floor and in the discharge of their offices. Only their own chambers within the Assembly could order the arrest of a member during his tenure. "With no actual responsibility for the actual conduct of affairs, the legislators were free to propose sweeping reforms, advocate ideal solutions, and denounce compromising and opportunistic conduct by the government." The Emperor was the head of both the moderating and executive branches (being aided by the Council of State and the Council of Ministers, respectively); he had the final say and held ultimate control over the national government. He was tasked with ensuring national independence and stability. The Constitution (Article 101) gave him very few avenues for imposing his will upon the General Assembly. His main recourse was the right to dissolve or extend legislative sessions. In the Senate, an emperor's authority to appoint senators did not necessarily give him added influence since senators held their offices for life and were thus freed from government pressure once confirmed. On those occasions when the Chamber of Deputies was dissolved, new elections were required to be held immediately and the new Chamber seated. "This power was effective when held in reserve as a threat. It could not be employed repeatedly, nor would its use work to the emperor's advantage." During the reign of Pedro I the Chamber of Deputies was never dissolved and legislative sessions were never extended or postponed. Under Pedro II, the Chamber of Deputies was only ever dissolved at the request of the President of the Council of Ministers (Prime minister). There were eleven dissolutions during Pedro II's reign and, of these, ten occurred after consultation with the Council of State, which was beyond what was required by the Constitution. A Constitutional balance of power existed between the General Assembly and the executive branch under the Emperor. The legislature could not operate alone and the monarch could not force his will upon the Assembly. The system functioned smoothly only when both Assembly and Emperor acted in a spirit of cooperation for the national good. A new element was added when the office of "President of the Council of Ministers" was officially created in 1847—although it had existed in practice since 1843. The president of the Council owed his position to both his party and to the Emperor and these could sometimes come into conflict. 19th-century abolitionist leader and historian Joaquim Nabuco said that the "President of the Council in Brazil was no Russian Chancellor, Sovereign's creature, nor a British Prime Minister, made only by the trust of the [House of] Commons: the delegation of the Crown was to him as necessary and important as the delegation of the Chamber, and, to exert with safety his functions, he had to dominate the caprice, the oscillations and ambitions of the Parliament, as well as to preserve always unalterable the favor, the good will of the emperor." Rio de Janeiro, a metropolis and imperial capital, 1889 (Brazilian southeast). All provinces had great autonomy in relation to the national government. When enacted in 1824, the Imperial Constitution created the Conselho Geral de Província (Provincial General Council), the legislature of the provinces. This council was composed of either 21 or 13 elected members, depending on the size of a province's population. All "resolutions" (laws) created by the councils required approval by the General Assembly, with no right of appeal. Provincial Councils also had no authority to raise revenues, and their budgets had to be debated and ratified by the General Assembly. Provinces had no autonomy and were entirely subordinate to the national government. With the 1834 constitutional amendment known as the Additional Act, Provincial General Councils were supplanted by the Assembleias Legislativas Provinciais (Provincial Legislative Assemblies). The new Assemblies enjoyed much greater autonomy from the national government. A Provincial Assembly was composed of 36, 28 or 20 elected deputies, the number depending on the size of the province's population. The election of provincial deputies followed the same procedure as used to elect general deputies to the national Chamber of Deputies. The responsibilities of the Provincial Assembly included defining provincial and municipal budgets and levying the taxes necessary to support them; providing primary and secondary schools (higher education was the responsibility of the national government); oversight and control of provincial and municipal expenditures; and providing for law enforcement and maintenance of police forces. The Assemblies also controlled the creation and abolishment of, and salaries for, positions within provincial and municipal civil services. The nomination, suspension and dismissal of civil servants was reserved for the president (governor) of the province, but how and under what circumstances he could exercise these prerogatives was delineated by the Assembly. The expropriation of private property (with due monetary compensation) for provincial or municipal interests was also a right of the Assembly. In effect, the Provincial Assembly could enact any kind of law—with no ratification by Parliament—so long as such local laws did not violate or encroach upon the Constitution. However, provinces were not permitted to legislate in the areas of criminal law, criminal procedure laws, civil rights and obligations, the armed forces, the national budget or matters concerning national interests, such as foreign relations. The provincial presidents were appointed by the national government and were, in theory, charged with governing the province. In practice, however, their power was intangible, varying from province to province based upon each president's relative degree of personal influence and personal character. Since the national government wanted to ensure their loyalty, presidents were, in most cases, sent to a province in which they had no political, familial or other ties. In order to prevent them from developing any strong local interests or support, presidents would be limited to terms of only a few months in office. As the president usually spent a great deal of time away from the province, often traveling to their native province or the imperial capital, the de facto governor was the vice-president, who was chosen by the Provincial Assembly and was usually a local politician. With little power to undermine provincial autonomy, the president was an agent of the central government with little function beyond conveying its interests to the provincial political bosses. Presidents could be used by the national government to influence, or even rig, elections, although to be effective the president had to rely on provincial and local politicians who belonged to his own political party. This interdependency created a complex relationship which was based upon exchanges of favors, private interests, party goals, negotiations, and other political maneuvering. The câmara municipal (town council) was the governing body in towns and cities and had existed in Brazil since the beginning of the colonial period in the 16th century. The Chamber was composed of vereadores (councilmen), the number of which depended on the size of the town. Unlike the Provincial General Council, the Constitution gave town councils great autonomy. However, when the Provincial Assembly replaced the Provincial General Council in 1834, many of the powers of town councils (including the setting of municipal budgets, oversight of expenditures, creation of jobs, and the nomination of civil servants) were transferred to the provincial government. Additionally, any laws enacted by the town council had to be ratified by the Provincial Assembly—but not by Parliament. While the 1834 Additional Act granted greater autonomy to the provinces from the central government, it transferred the towns' remaining autonomy to the provincial governments. There was no office of mayor, and towns were governed by a town council and its president (who was the councilman who won the most votes during elections). Until 1881, voting was mandatory and elections occurred in two stages. In the first phase voters chose electors who then selected a slate of senatorial candidates. The Emperor would choose a new senator (member of the Senate, the upper house in the General Assembly) from a list of the three candidates who had received the highest number of votes. The Electors also chose the General Deputies (members of the Chamber of Deputies, the lower house), provincial deputies (members of the Provincial Assemblies) and councilmen (members of the town councils) without the involvement of the Emperor in making a final selection. All men over the age of 25 with an annual income of at least Rs 100$000 (or 100,000 réis; the equivalent in 1824 to $98 U.S.) were eligible to vote in the first phase. The voting age was lowered to 21 for married men. To become an elector it was necessary to have an annual income of at least Rs 200$000. The Brazilian system was relatively democratic for a period during which indirect elections were common in democracies. The income requirement was much higher in the United Kingdom, even after the reforms of 1832. At the time the only nations not requiring a minimum level of income as a qualification for voting were France and Switzerland where universal suffrage was introduced only in 1848. It is probable that no European country at the time had such liberal legislation as Brazil. The income requirement was low enough that any employed male citizen could qualify to vote. As an illustration, the lowest paid civil employee in 1876 was a janitor who earned Rs 600$000 annually. Most voters in Brazil had a low income. For example, in the Minas Gerais town of Formiga in 1876, the poor constituted 70% of the electorate. In Irajá in the province of Rio de Janeiro, the poor were 87% of the electorate. Former slaves could not vote, but their children and grandchildren could, as could the illiterate (which few countries allowed). In 1872, 10.8% of the Brazilian population voted (13% of the non-slave population). By comparison, electoral participation in the UK in 1870 was 7% of the total population; in Italy it was 2%; in Portugal 9%; and in the Netherlands 2.5%. In 1832, the year of the British electoral reform, 3% of the British voted. Further reforms in 1867 and 1884 expanded electoral participation in the UK to 15%. Although electoral fraud was common, it was not ignored by the Emperor, politicians or observers of the time. The problem was considered a major issue and attempts were made to correct abuses, with legislation (including the electoral reforms of 1855, 1875 and 1881) repeatedly being enacted to combat fraud. The 1881 reforms brought significant changes: they eliminated the two-stage electoral system, introduced direct and facultative voting, and allowed the votes of former slaves and enfranchised non-Catholics. Conversely, illiterate citizens were no longer allowed to vote. Participation in elections dropped from 13% to only 0.8% in 1886. In 1889, about 15% of the Brazilian population could read and write, so disenfranchising the illiterate does not solely explain the sudden fall in voting percentages. The discontinuation of mandatory voting and voter apathy may have been significant factors contributing to the reduction in the number of voters. Under Articles 102 and 148 of the Constitution, the Brazilian Armed Forces were subordinate to the Emperor as Commander-in-Chief. He was aided by the Ministers of War and Navy in matters concerning the Army and the Armada (Navy)—although the President of the Council of Ministers usually exercised oversight of both branches in practice. The ministers of War and Navy were, with few exceptions, civilians. The military was organized along similar lines to the British and American armed forces of the time, in which a small standing army could quickly augment its strength during emergencies from a reserve militia force (in Brazil, the National Guard). Brazil's first line of defense relied upon a large and powerful navy to protect against foreign attack. As a matter of policy, the military was to be completely obedient to civilian governmental control and to remain at arm's length from involvement in political decisions. Military personnel were allowed to run for and serve in political office while remaining on active duty. However they did not represent the Army or the Armada, but were instead expected to serve the interests of the city or province which had elected them. Pedro I chose nine military officers as Senators and appointed five (out of fourteen) to the Council of State. During the Regency, two were named to the Senate and none to the Council of State (this body was dormant during the Regency). Pedro II chose four officers as Senators during the 1840s, two in the 1850s and three others during the remaining years of his reign. He also appointed seven officers to be State Councilors during the 1840s and 1850s, and three others after that. The Brazilian Armed Forces were created in the aftermath of Independence. They were originally composed of Brazilian- and Portuguese-born officers and troops who had remained loyal to the government in Rio de Janeiro during the war of secession from Portugal. The Armed Forces were crucial to the successful outcomes of international conflicts faced by the Empire, starting with Independence (1822–1824), followed by the Cisplatine War (1825–1828), then the Platine War (1851–1852), the Uruguayan War (1864–1865) and, finally, the Paraguayan War (1864–1870). They also played a part in quelling rebellions, beginning with the Confederation of the Equator (1824) under Pedro I, followed by the uprisings during Pedro II's early reign, such as the Ragamuffin War (1835–1845), Cabanagem (1835–1840), Balaiada (1838–1841), among others. The Armada was constantly being modernized with the latest developments in naval warfare. It adopted steam navigation in the 1830s, ironclad plate armor in the 1860s, and torpedoes in the 1880s. By 1889, Brazil had the fifth or sixth most powerful navy in the world and the most powerful battleships in the western hemisphere. The Army, despite its highly experienced and battle-hardened officer corps, was plagued during peacetime by units which were badly paid, inadequately equipped, poorly trained and thinly spread across the vast Empire. Dissension resulting from inadequate government attention to Army needs was restrained under the generation of officers who had begun their careers during the 1820s. These officers were loyal to the monarchy, believed the military should be under civilian control, and abhorred the caudillism (Hispanic-American dictatorships) against which they had fought. But by the early 1880s, this generation (including commanders such as the Duke of Caxias, the Count of Porto Alegre, and the Marquis of Erval) had died, were retired, or no longer exercised direct command. Dissatisfaction became more evident during the 1880s, and some officers began to display open insubordination. The Emperor and the politicians did nothing to improve the military nor meet their demands. The dissemination of Positivist ideology among young officers brought further complications, as Positivism opposed the monarchy under the belief that a dictatorial republic would bring improvements. A coalition between a mutinous Army faction and the Positivist camp was formed and directly led to the republican coup on 15 November 1889. Battalions and even full regiments of soldiers loyal to the Empire, who shared the ideals of the older generation of leaders, attempted to restore the monarchy. Attempts at a restoration proved futile and supporters of the Empire were executed, arrested or forcibly retired. Upon independence from Portugal, the immediate focus of Brazil's foreign policy was to gain widespread international recognition. The first nation to recognize Brazilian sovereignty was the United States, in May 1825. Other nations followed in establishing diplomatic relations over the next few years. Portugal recognized the separation in August 1825. The Brazilian government subsequently made it a priority to establish its international borders through treaties with its neighbors. The task of securing recognized frontiers was complicated by the fact that, between 1777 and 1801, Portugal and Spain had annulled their previous treaties setting out the borders between their American colonial empires. However, the Empire was able to sign several bilateral treaties with neighbors, including Uruguay (in 1851), Peru (in 1851 and 1874), the Republic of New Granada (later Colombia, in 1853), Venezuela (in 1859), Bolivia (in 1867) and Paraguay (in 1872). By 1889, most of its borders were firmly established. The remaining issues—including the purchase of the region of Acre from Bolivia which would give Brazil its present-day configuration—were only finally resolved after the country became a republic. A number of conflicts occurred between the Empire and its neighbors. Brazil experienced no serious conflicts with its neighbors to the north and west, due to the buffer of the nearly impenetrable and sparsely populated Amazonian rainforest. [B] In the south, however, the colonial disputes inherited from Portugal and Spain over the control of the navigable rivers and plains which formed the frontiers continued after independence. The lack of mutually agreed borders in this area led to several international conflicts, from the Cisplatine War to the Paraguayan War. "Brazil is, next to ourselves, the great power on the American continent", affirmed James Watson Webb, the U.S. minister to Brazil, in 1867. The Empire's rise was noticed as early as 1844 by John C. Calhoun, the U.S. Secretary of State: "Next to the United States, Brazil is the most wealthy, the greatest and the most firmly established of all the American powers." By the early 1870s, the international reputation of the Empire of Brazil had improved considerably, and it remained well-regarded internationally until its end in 1889. Christopher Columbus Andrews, an American diplomat in the Brazilian capital in the 1880s, later recalled Brazil as an "important Empire" in his memoirs. In 1871, Brazil was invited to arbitrate the dispute between the United States and Britain which became known as the Alabama Claims. In 1880, the Empire acted as arbiter between the United States and France over the damage caused to U.S. nationals during the French intervention in Mexico. In 1884, Brazil was called upon to arbitrate between Chile and several other nations (France, Italy, Britain, Germany, Belgium, Austria-Hungary and Switzerland) over damages arising from the War of the Pacific. The Brazilian government eventually felt confident enough to negotiate a trade deal with the United States in 1889, the first to be undertaken with any nation since the disastrous and exploitative trade treaty with Britain in 1826 (canceled in 1844). American historian Steven C. Topik said that Pedro II's "quest for a trade treaty with the United States was part of a grander strategy to increase national sovereignty and autonomy." Unlike the circumstances of the previous pact, the Empire was in a strong position to insist on favorable trade terms, as negotiations occurred during a time of Brazilian domestic prosperity and international prestige. Brazil's international trade reached a total value of Rs 79.000:000$000 between 1834 and 1839. This continued to increase every year until it reached Rs 472.000:000$000 between 1886 and 1887: an annual growth rate of 3.88% since 1839. The absolute value of exports from the Empire in 1850 was the highest in Latin America and triple that of Argentina which was in fourth place. Brazil would keep its high standing in exports and general economic growth until the end of the monarchy. Brazilian economic expansion, especially after 1850, compared well with that of the United States and European nations. The national tax revenue amounted to Rs 11.795:000$000 in 1831 and rose to Rs 160.840:000$000 in 1889. By 1858, national tax revenues ranked as the eighth-largest in the world. Imperial Brazil was, despite its progress, a country where wealth was very unequally distributed. However, for purposes of comparison, according to historian Steven C. Topik, in the United States, "by 1890, 80 percent of the population lived on the margin of subsistence, while 20 percent controlled almost all wealth." As new technologies appeared, and with increases in internal productivity, exports increased considerably. This made it possible to reach equilibrium in the balance of trade. During the 1820s sugar constituted about 30% of total exports while cotton constituted 21%, coffee 18% and leather and skins 14%. Twenty years later coffee would reach 42%, sugar 27%, leather and skins 9%, and cotton 8% of the total exports. This did not mean a reduction in the production of any of these items and, in fact, the opposite occurred. Growth occurred in all sectors, some more than others. In the period between 1820 and 1840, Fausto says "Brazilian exports had doubled in volume and had tripled in nominal value" while the valuation denominated in Pounds sterling increased by over 40%. Brazil was not the only country where agriculture played an important role on exports. Around 1890, in the United States, by then the richest nation in the Americas, agricultural goods represented 80% of all its exports. In the 1820s, Brazil exported 11,000 tons of cacao and by 1880 this had increased to 73,500 tons. Between 1821 and 1825, 41,174 tons of sugar were exported, rising to 238,074 tons between 1881 and 1885. Until 1850, rubber production was insignificant, but between 1881 and 1890, it had reached third place among Brazilian exports. This was about 81 tons between 1827 and 1830 reaching 1,632 tons in 1852. By 1900 the country was exporting 24,301,452 tons of rubber. Brazil also exported around 3,377,000 tons of coffee between 1821 and 1860 while between 1861 and 1889 this reached 6,804,000 tons. Technological innovations also contributed to the growth of exports, in particular the adoption of steam navigation and railroads allowed for faster and more convenient cargo transportation. Development on an immense scale occurred during this period, anticipating similar advancements in European countries. In 1850, there were fifty factories with a total capital of Rs 7.000:000$000. At the end of the Imperial period in 1889, Brazil had 636 factories representing an annual rate of increase of 6.74% over the number in 1850, and with a total capital of approximately Rs 401.630:600$000 (which represents an annual growth rate in value of 10.94% from 1850 to 1889). The "countryside echoed with the clang of iron track being laid as railroads were constructed at the most furious pace of the 19th century; indeed, building in 1880s was the second greatest in absolute terms in Brazil's entire history. Only eight countries in the entire world laid more track in the decade than Brazil." The first railroad line, with only 15 kilometres (9.3 mi) of track, was opened on 30 April 1854 at a time when many European countries had no rail service. By 1868, there were 718 kilometres (446 mi) of railroad lines, and by the end of the Empire in 1889 this had grown to 9,200 kilometres (5,700 mi) with another 9,000 kilometres (5,600 mi) under construction making it the country with "the largest rail network in Latin America". 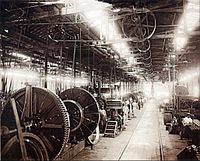 Factories were constructed throughout the Empire in the 1880s, allowing Brazil's cities to be modernized and "receive the benefits of gas, electrical, sanitation, telegraph and tram companies. Brazil was entering the modern world." It was the fifth country in the world to install modern city sewers, the third to have sewage treatment and one of the pioneers in the installation of a telephone service. In addition to the foregoing improvements to infrastructure, it was also the first South American nation to adopt public electric lighting (in 1883) and the second in the Americas (behind the United States) to establish a transatlantic telegraphic line connecting it directly to Europe in 1874. The first domestic telegraph line appeared during 1852 in Rio de Janeiro. By 1889, there were 18,925 kilometres (11,759 mi) of telegraph lines connecting the country's capital to distant Brazilian provinces such as Pará and even linking to other South American countries such as Argentina and Uruguay. Since the second half of the 18th century, when Brazil was still a colony, the government had attempted to gather data regarding the population. However, few captaincies (later called provinces) collected the requested information. After independence the government instituted a commission for statistics in an 1829 decree with a mandate to hold a national census. The commission was a failure and was disbanded in 1834. In the ensuing years, provincial governments were tasked with collecting census information, but their census reports were often incomplete or not submitted at all. In 1851, another attempt at a nationwide census failed when rioting broke out. This was the result of the erroneous belief among Brazilians of mixed-race descent that the survey was a subterfuge designed to enslave anyone having African blood. The first true national census with exhaustive and broad coverage was carried out in 1872. The small number of people and small number of towns reported by the census reveal Brazil's enormous territory to have been sparsely populated. It showed Brazil as having a total population of 9,930,478 inhabitants. Estimates made by the government in prior decades showed 4,000,000 inhabitants in 1823 and gave a figure of 7,000,700 in 1854. The population was distributed across 20 provinces and the Neutral Municipality (the Empire's capital) with 641 municipalities. Among the free population 23.4% of males and 13.4% of females were considered literate. Men represented 52% (5,123,869) of the total population. Figures for the population by age showed 24.6% were children younger than 10 years old; 21.1% were adolescents and young men between 11 and 20; 32.9% were adults between 21 and 40; 8.4% were between 41 and 50; 12.8% were between 51 and 70; and lastly, only 3.4% were over 71. The residents in the combined northeast and southeast regions comprised 87.2% of the nation's population. The second national census was held in 1890 when the Brazilian republic was only a few months old. Its results showed that the population had grown to 14,333,915 inhabitants since the 1872 census. Four ethnic groups were recognized in Imperial Brazil: white, black, Indian and brown. Brown (Portuguese: pardo) was a designation for multiracial Brazilians which is still officially used, though some scholars prefer the term "mixed one" (Portuguese: mestiço). The term denotes a broad category which includes caboclos (descendants of whites and Indians), mulattoes (descendants of whites and blacks) and cafuzos (descendants of blacks and Indians). The caboclos formed the majority of the population in the Northern, Northeastern and Central-Western regions. A large mulatto population inhabited the eastern coast of the northeastern region from Bahia to Paraíba and were also present in northern Maranhão, southern Minas Gerais, eastern Rio de Janeiro and in Espírito Santo. The cafuzos were the smallest and most difficult to distinguish from the two other mixed-race subgroups since the descendants of caboclos and mulattoes also fell into this category and were found in the northeast sertão (English: hinterland). These groups may still be found in the same areas today. White Brazilians descended from the original Portuguese settlers. From the 1870s onwards this ethnic group also included other European immigrants: mainly Italians, Spaniards and Germans. Although whites could be found throughout the country, they were the majority group in the southern region and in São Paulo province. Whites also comprised a significant proportion (40%) of the population in the northeastern provinces of Ceará, Paraíba and Rio Grande do Norte. Black Brazilians of Sub-Saharan African ancestry inhabited the same areas as mulattoes. The majority of the population of Rio de Janeiro, Minas Gerais, Espírito Santo, Bahia, Sergipe, Alagoas and Pernambuco provinces (the last four having the smallest percentages of whites in the whole country—less than 30% in each) were black or brown. The Indians, the indigenous peoples of Brazil, were found mainly in Piauí, Maranhão, Pará and Amazonas. Because of the existence of distinct racial and cultural communities, 19th century Brazil developed as a multi-ethnic nation. However the data is problematic as no reliable information is available for the years prior to 1872. The first official national census was compiled by the government in 1872 showing that out of 9,930,479 inhabitants there were 38.1% whites, 38.3% browns, 19.7% blacks and 3.9% Indians. The second official national census in 1890 revealed that in a population of 14,333,915, 44% were whites, 32.4% browns, 14.6% blacks and 9% Indians. Prior to 1808, the Portuguese were the only European people to settle Brazil in significant numbers. Although British, Germans, Italians and Spanish had previously immigrated to Brazil, they had only done so as a small number of individuals or in very small groups. These earliest non-Portuguese settlers did not have a significant impact on the culture of Portugal's Brazilian colony. The situation changed after 1808 when King João VI began to encourage immigration from European countries outside Portugal. The first to arrive in numbers were the Swiss, of whom some 2,000 settled in Rio de Janeiro province during 1818. They were followed by Germans and Irish, who immigrated to Brazil in the 1820s. German settlers gravitated mostly to the southern provinces, where the environment was more like their homeland. In the 1830s, due to the instability of the Regency, European immigration ground to a halt, only recovering after Pedro II took the reins of government and the country entered a period of peace and prosperity. Farmers in the southeast, enriched by lucrative coffee exports, created the "partnership system" (a form of indentured servitude) to attract immigrants. The scheme endured until the end of the 1850s, when the system collapsed and was abandoned. The failure was rooted in the large debts European settlers incurred in order to subsidize their travel and settlement expenses, leaving them as virtual slaves to their employers. Immigration suffered another decline during the Paraguayan War, which lasted from 1864 to 1870. Immigrant numbers soared during the 1870s in what came to be called the "great immigration". Up to that point, around 10,000 Europeans arrived in Brazil annually, but after 1872, their numbers increased dramatically. It is estimated by the Brazilian Institute of Geography and Statistics that 500,000 Europeans immigrated to Brazil between 1808 and 1883. The figure for European settlers arriving between 1884 and 1893 climbed to 883,668. The number of Europeans immigrating continued to rise in the following decades, with 862,100 between 1894 and 1903; and 1,006,617 between 1904 and 1913. From 1872 until 1879, the nationalities forming the bulk of the new settlers were composed of Portuguese (31.2%), Italians (25.8%), Germans (8.1%) and Spanish (1.9%). In the 1880s, Italians would surpass the Portuguese (61.8% to 23.3% respectively), and the Spanish would displace the Germans (6.7% to 4.2% respectively). Other, smaller groups also arrived, including Russians, Poles and Hungarians. Since nearly all European immigrants settled in the southeastern and southern areas of the Empire, ethnic distribution, already unequal before the mass immigration, became even more divergent between regions. For a nation that had a small, widely scattered population (4,000,000 in 1823 and 14,333,915 in 1890), the immigration of more than 1,380,000 Europeans had a tremendous effect upon the country's ethnic composition. In 1872, the year of the first reliable national census, white Brazilians represented just over a third (38.1%) of the total population; in 1890, they had increased to a little under half (44.0%) of all Brazilians. In 1823, a year after independence, slaves made up 29% of the population of Brazil, a figure which fell throughout the lifetime of the Empire: from 24% in 1854, to 15.2% in 1872, and finally to less than 5% in 1887—the year before slavery was completely abolished. Slaves were mostly adult males from southwestern Africa. Slaves brought to Brazil differed ethnically, religiously and linguistically, each identifying primarily with his or her own nation of origin, rather than by a shared African ethnicity. Some of the slaves brought to the Americas had been captured while fighting intertribal wars in Africa and had then been sold to slave dealers. Slaves and their descendants were usually found in regions devoted to producing exports for foreign markets. Sugarcane plantations on the eastern coast of the northeast region during the 16th and 17th centuries are typical of economic activities dependent on slave labor. In northern Maranhão province, slave labor was used in cotton and rice production in the 18th century. In this period, slaves were also exploited in Minas Gerais province where gold was extracted. Slavery was also common in Rio de Janeiro and São Paulo during the 19th century for the cultivation of coffee which became vital to the national economy. The prevalence of slavery was not geographically uniform across Brazil. Around 1870 only five provinces (Rio de Janeiro with 30%, Bahia with 15%, Minas Gerais with 14%, São Paulo with 7% and Rio Grande do Sul also with 7%) held 73% of the nation's total slave population. These were followed by Pernambuco (with 6%) and Alagoas (with 4%). Among the remaining 13 provinces none individually had even 3%. Most slaves worked as plantation laborers. Relatively few Brazilians owned slaves and most small and medium-sized farms employed free workers. Slaves could be found scattered throughout society in other capacities: some were used as house servants, farmers, miners, prostitutes, gardeners and in many other roles. Many emancipated slaves went on to acquire slaves and there were even cases of slaves who had their own slaves. While slaves were usually black or mulatto there were reported cases of slaves who appeared to be of European descent—the product of generations of inter-ethnic sexual relations between male slave owners and their female mulatto slaves. Even the harshest slave owners adhered to a long-established practice of selling slaves along with their families, taking care not to separate individuals. Slaves were regarded by law as properties. The ones who were freed immediately became citizens with all civil rights guaranteed—the only exception being that, until 1881, freed slaves were barred from voting in elections, although their children and descendants could vote. The nobility of Brazil differed markedly from its counterparts in Europe: noble titles were not hereditary, with the sole exception of members of the Imperial Family, and those who had received a noble title were not considered to belong to a separate social class, and received no appanages, stipends or emoluments. However, many ranks, traditions, and regulations in Brazil's system of nobility were co-opted directly from the Portuguese aristocracy. During Pedro I's reign there were no clear requisites for someone to be ennobled. During Pedro II's reign (apart from the Regency period during which the regent could not grant titles or honors) the nobility evolved into a meritocracy with titles granted in recognition of an individual's outstanding service to the Empire or for the public good. Noble rank did not represent "recognition of illustrious ancestry." It was the Emperor's right as head of the Executive branch to grant titles and honors. The titles of nobility were, in ascending order, baron, viscount, count, marquis and duke. Apart from position in the hierarchy there were other distinctions between the ranks: counts, marquises and dukes were considered "Grandees of the Empire" while the titles of barons and viscounts could be bestowed "with Greatness" or "without Greatness". All ranks of the Brazilian nobility were to be addressed as "Your Excellency". Between 1822 and 1889, 986 people were ennobled. Only three became Dukes: Auguste de Beauharnais, 2nd Duke of Leuchtenberg (as Duke of Santa Cruz, brother-in-law to Pedro I), Dona Isabel Maria de Alcântara Brasileira (as Duchess of Goiás, illegitimate daughter of Pedro I) and lastly Luís Alves de Lima e Silva (as Duke of Caxias, commander-in-chief during the Paraguayan War). The other titles granted were as follows: 47 marquises, 51 counts, 146 viscounts "with Greatness", 89 viscounts "without Greatness", 135 barons "with Greatness" and 740 barons "without Greatness" resulting in a total of 1,211 noble titles. There were fewer nobles than noble titles because many were elevated more than once during their lifetime, such as the Duke of Caxias who was first made a baron, then a count, then a marquis and finally was elevated to a duke. Grants of nobility were not limited to male Brazilians: Thomas Cochrane, 10th Earl of Dundonald, a Scot, was made Marquis of Maranhão for his role in the Brazilian War of Independence, and 29 women received grants of nobility in their own right. As well as being unrestricted by gender, no racial distinctions were made in conferring noble status. Caboclos, mulattoes, blacks and even Indians were ennobled. The lesser nobility, who were untitled, were made up of members of the Imperial Orders. There were six of these: the Order of Christ, the Order of Saint Benedict of Aviz, the Order of Saint James of the Sword, the Order of the Southern Cross, the Order of Pedro I and the Order of the Rose. The first three had grades of honor beyond the Grand Master (reserved for the Emperor only): knight, commander and grand cross. The latter three, however, had different ranks: the Order of the Southern Cross with four, the Order of the Rose with six, and the Order of Pedro I with three. Article five of the Constitution declared Catholicism to be the state religion. However, the clergy had long been understaffed, undisciplined and poorly educated, all of which led to a general loss of respect for the Catholic Church. During Pedro II's reign, the Imperial government embarked upon a program of reform designed to address these deficiencies. As Catholicism was the official religion, the Emperor exercised a great deal of control over Church affairs and paid clerical salaries, appointed parish priests, nominated bishops, ratified papal bulls and supervised seminaries. In pursuing reform, the government selected bishops whose moral fitness, stance on education and support for reform met with their approval. However, as more capable men began to fill the clerical ranks, resentment of government control over the Church increased. Catholic clerics moved closer to the Pope and his doctrines. This resulted in the Religious Question, a series of clashes during the 1870s between the clergy and the government, since the former wanted a more direct relationship with Rome and the latter sought to maintain its oversight of church affairs. The Constitution did allow followers of other, non-Catholic, faiths to practice their religious beliefs, albeit only in private. The construction of non-Catholic religious buildings was forbidden. From the outset these restrictions were ignored by both the citizenry and authorities. In Belém, Pará's capital, the first synagogue was built in 1824. Jews migrated to Brazil soon after its independence and settled mainly in the northeastern provinces of Bahia and Pernambuco and in the northern provinces of Amazonas and Pará. Other Jewish groups came from the Alsace-Lorraine region of Germany and from Russia. By the 1880s, there were several Jewish communities and synagogues scattered throughout Brazil. The Protestants were another group that began settling in Brazil at the beginning of the 19th century. The first Protestants were English, and an Anglican church was opened in Rio de Janeiro in 1820. Others were established afterwards in São Paulo, Pernambuco and Bahia provinces. They were followed by German and Swiss Lutherans who settled in the South and Southwest regions and built their own houses of worship. Following the U.S. Civil War in the 1860s, immigrants from the southern United States seeking to escape Reconstruction settled in São Paulo. Several American churches sponsored missionary activities, including Baptists, Lutherans, Congregationalists and Methodists. Among African slaves, Catholicism was the religion of the majority. Most slaves came originally from the midwestern and southwestern portions of the African coast. For over four centuries this region had been the subject of Christian mission activities. Some Africans and their descendants, however, held onto elements of polytheistic religious traditions by merging them with Catholicism. This resulted in the creation of syncretic creeds such as Candomblé. Islam was also practiced among a small minority of African slaves, although it was harshly repressed and by the end of the 19th century had been completely extinguished. By the beginning of the 19th century, the Indians in most of eastern Brazil had been either assimilated or decimated. Some tribes resisted assimilation and either fled farther west, where they were able to maintain their diverse polytheistic beliefs, or were restricted to aldeamentos (reservations), where they eventually converted to Catholicism. According to historian Ronald Raminelli, "visual arts underwent huge innovations in the Empire in comparison to the colonial period." With independence in 1822, painting, sculpture and architecture were influenced by national symbols and the monarchy, as both surpassed religious themes in their importance. The previously dominant old Baroque style was superseded by Neoclassicism. New developments appeared, such as the use of iron in architecture and the appearance of lithography and photography, which revitalized the visual arts. The government's creation of the Imperial Academy of the Fine Arts in the 1820s played a pivotal role in influencing and expanding the visual arts in Brazil, mainly by educating generations of artists but also by serving as a stylistic guideline. The Academy's origins lay in the foundation of the Escola Real das Ciências, Artes e Ofícios (Royal School of the Sciences, Arts and Crafts) in 1816 by the Portuguese King João VI. Its members—of whom the most famous was Jean-Baptiste Debret—were French émigrées who worked as painters, sculptors, musicians and engineers. The school's main goal was to encourage French aesthetics and the Neoclassical style to replace the prevalent baroque style. Plagued by a lack of funds since its inception, the school was later renamed as the Academy of Fine Arts in 1820, and in 1824 received its final name under the Empire: Imperial Academy of the Fine Arts. It was only following Pedro II's majority in 1840, however, that the Academy became a powerhouse, part of the Emperor's greater scheme of fomenting a national culture and consequently uniting all Brazilians in a common sense of nationhood. Pedro II would sponsor the Brazilian culture through several public institutions funded by the government (not restricted to the Academy of Fine Arts), such as Brazilian Historic and Geographic Institute and Imperial Academy of Music and National Opera. That sponsorship would pave the way not only for the careers of artists, but also for those engaged in other fields, including historians such as Francisco Adolfo de Varnhagen and musicians such as the operatic composer Antônio Carlos Gomes. By the 1840s, Romanticism had largely supplanted Neoclassicism, not only in painting, but also in sculpture and architecture. The Academy did not resume its role of simply providing education: prizes, medals, scholarships in foreign countries and funding were used as incentives. Among its staff and students were some of the most renowned Brazilian artists, including Simplício Rodrigues de Sá, Félix Taunay, Manuel de Araújo Porto-alegre, Pedro Américo, Victor Meirelles, Rodolfo Amoedo, Almeida Júnior, Rodolfo Bernardelli and João Zeferino da Costa. In the 1880s, after having been long regarded as the official style of the Academy, Romanticism declined, and other styles were explored by a new generation of artists. Among the new genres was Landscape art, the most famous exponents of which were Georg Grimm, Giovanni Battista Castagneto, França Júnior and Antônio Parreiras. Another style which gained popularity in the fields of painting and architecture was Eclecticism. In the first years after independence, Brazilian literature was still heavily influenced by Portuguese literature and its predominant Neoclassical style. In 1837, Gonçalves de Magalhães published the first work of Romanticism in Brazil, beginning a new era in the nation. The next year, 1838, saw the first play performed by Brazilians with a national theme, which marked the birth of Brazilian theater. Until then themes were often based on European works even if not performed by foreign actors. Romanticism at that time was regarded as the literary style that best fitted Brazilian literature, which could reveal its uniqueness when compared to foreign literature. During the 1830s and 1840s, "a network of newspapers, journals, book publishers and printing houses emerged which together with the opening of theaters in the major towns brought into being what could be termed, but for the narrowness of its scope, a national culture". Romanticism reached its apogee between the late 1850s and the early 1870s as it divided into several branches, including Indianism and sentimentalism. The most influential literary style in 19th-century Brazil, many of the most renowned Brazilian writers were exponents of Romanticism: Manuel de Araújo Porto Alegre, Gonçalves Dias, Gonçalves de Magalhães, José de Alencar, Bernardo Guimarães, Álvares de Azevedo, Casimiro de Abreu, Castro Alves, Joaquim Manuel de Macedo, Manuel Antônio de Almeida and Alfredo d'Escragnolle Taunay. In theater, the most famous Romanticist playwrights were Martins Pena and Joaquim Manuel de Macedo. Brazilian Romanticism did not have the same success in theater as it had in literature, as most of the plays were either Neoclassic tragedies or Romantic works from Portugal or translations from Italian, French or Spanish. After the opening of the Brazilian Dramatic Conservatory in 1845, the government gave financial aid to national theater companies in exchange for staging plays in Portuguese. By the 1880s Romanticism was superseded by new literary styles. The first to appear was Realism, which had among its most notable writers Joaquim Maria Machado de Assis and Raul Pompeia. Newer styles that coexisted with Realism, Naturalism and Parnassianism, were both connected to the former's evolution. Among the best-known Naturalists were Aluísio Azevedo and Adolfo Caminha. Notable Parnassians were Gonçalves Crespo, Alberto de Oliveira, Raimundo Correia and Olavo Bilac. Brazilian theater became influenced by Realism in 1855, decades earlier than the style's impact upon literature and poetry. Famous Realist playwrights included José de Alencar, Quintino Bocaiuva, Joaquim Manuel de Macedo, Júlia Lopes de Almeida and Maria Angélica Ribeiro. Brazilian plays staged by national companies competed for audiences alongside foreign plays and companies. Performing arts in Imperial Brazil also encompassed the staging of musical duets, dancing, gymnastics, comedy and farces. Less prestigious, but more popular with the working classes were puppeteers and magicians, as well as the circus, with its travelling companies of performers, including acrobats, trained animals, illusionists and other stunt-oriented artists. 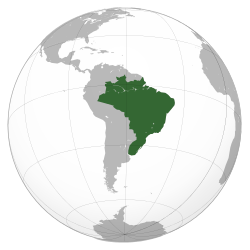 ^ During the 19th century, Brazil was divided into only two geographical regions: north (roughly present-day northeast and north) and south (roughly present-day central-west, southeast and south). See Vainfas 2002, p. 39. ^ The only exceptions regarding border disputes in the north and west were minor diplomatic disputes with France and Britain in the northern region. During the 1830s, both countries occupied and unsuccessfully attempted to claim some areas in the north as part of their colonial empires. See Viana 1994, p. 575. ^ Viana 1994, pp. 42–44. ^ Viana 1994, pp. 59, 65, 66, 78, 175, 181, 197, 213, 300. ^ Barman 1988, pp. 43–44. ^ Barman 1988, p. 72. ^ Viana 1994, p. 396. ^ Barman 1988, pp. 75, 81–82. ^ Viana 1994, pp. 399, 403. ^ Viana 1994, pp. 408–408. ^ Barman 1988, p. 96. ^ Viana 1994, pp. 417–418. ^ Barman 1988, pp. 101–102. ^ Viana 1994, pp. 420–422. ^ Barman 1988, pp. 104–106. ^ Barman 1988, p. 128. ^ a b Barman 1988, p. 131. ^ Barman 1988, p. 142. ^ Barman 1988, p. 151. ^ Barman 1988, pp. 148–149. ^ Barman 1999, pp. 18–19. ^ Barman 1999, p. 19. ^ Barman 1988, p. 159. ^ Barman 1988, p. 160. ^ Barman 1988, pp. 161–163. ^ Barman 1999, p. 61. ^ Barman 1988, pp. 179–180. ^ a b Barman 1999, p. 317. ^ Barman 1999, p. 64. ^ Barman 1999, p. 58. ^ Barman 1999, pp. 68–73. ^ Barman 1999, p. 49. ^ a b Barman 1999, p. 109. ^ Barman 1999, p. 114. ^ a b Barman 1999, p. 123. ^ Barman 1999, p. 122. ^ Barman 1999, pp. 122–123. ^ Barman 1999, p. 124. ^ a b c Barman 1999, p. 125. ^ Carvalho 2007, pp. 102–103. ^ Levine 1999, pp. 63–64. ^ a b Barman 1999, p. 159. ^ a b Vainfas 2002, p. 343. ^ Lira 1977, Vol 1, p. 182. ^ Barman 1999, p. 162. ^ Barman 1999, p. 166. ^ Nabuco 1975, p. 162. ^ Nabuco 1975, p. 313. ^ Nabuco 1975, pp. 346, 370, 373, 376. ^ Nabuco 1975, p. 346. ^ Nabuco 1975, pp. 364–365. ^ Nabuco 1975, p. 378. ^ Nabuco 1975, pp. 374–376. ^ Barman 1999, p. 192. Lira 1977, Vol 1, p. 207. Lira 1977, Vol 1, p. 208. ^ Calmon 1975, p. 680. ^ Doratioto 2002, pp. 98, 203. ^ Calmon 1975, p. 684. Lira 1977, Vol 1, p. 211. Lira 1977, Vol 1, p. 219. ^ Lira 1977, Vol 1, p. 220. Lira 1977, Vol 1, pp. 224–225. ^ Carvalho 2007, p. 109. ^ Lira 1977, Vol 1, p. 227. ^ Calmon 1975, p. 748. ^ Lira 1977, Vol 1, p. 237. ^ a b Barman 1999, p. 222. ^ Nabuco 1975, p. 592. ^ a b Barman 1999, p. 223. ^ Nabuco 1975, p. 666. ^ Barman 1999, pp. 229–230. ^ Doratioto 2002, p. 461. ^ Doratioto 2002, p. 462. ^ Calmon 2002, p. 201. ^ Munro 1942, p. 276. ^ Barman 1999, p. 243. ^ a b c Lira 1977, Vol 2, p. 9. ^ Barman 1999, p. 240. ^ Barman 1999, p. 235. ^ a b Barman 1999, p. 238. ^ a b Barman 1999, p. 261. ^ Barman 1999, pp. 234, 317. ^ Barman 1999, p. 318. ^ Barman 1999, p. 298–299. ^ Barman 1999, p. 299. ^ Lira 1977, Vol 3, p. 126. ^ Barman 1999, p. 399. ^ Barman 1999, pp. 262–263. ^ Barman 1999, p. 130. ^ a b Barman 1999, p. 262. ^ Barman 1999, p. 268. ^ Barman 1999, p. 349. ^ Lira 1977, Vol 3, p. 121. ^ a b Carvalho 2007, p. 195. ^ a b c Barman 1999, p. 353. ^ Barman 1999, pp. 353–355. ^ a b c d e Topik 2000, p. 56. ^ Barman 1999, p. 341. ^ Barman 1999, p. 346. ^ Lira 1977, Vol 3, p. 78. ^ Barman 1999, p. 351. ^ Barman 1999, p. 355. ^ Barman 1999, p. 356. ^ Barman 1999, pp. 353–356. ^ Schwarcz 1998, p. 450. Lira 1977, Vol 3, p. 104. ^ Schwarcz 1998, p. 459. ^ Lira 1977, Vol 3, p. 96. ^ Besouchet 1993, p. 538. ^ Barman 1999, p. 361. Lira 1977, Vol 3, p. 99. ^ Carvalho 2007, p. 220. ^ Salles 1996, p. 194. ^ Barman 1999, p. 394. ^ Lira 1977, Vol 3, pp. 119–120. ^ a b Barman 1988, p. 132. ^ Barman 1988, pp. 132–133. ^ a b c d Barman 1988, p. 133. ^ Viana 1994, p. 476. ^ Carvalho 1993, p. 42. ^ Nabuco 1975, p. 712. ^ a b Dolhnikoff 2005, p. 59. ^ a b c Dolhnikoff 2005, p. 60. ^ Dolhnikoff 2005, pp. 64, 97. ^ a b Dolhnikoff 2005, p. 97. ^ Dolhnikoff 2005, p. 99. ^ Dolhnikoff 2005, p. 100. ^ a b Dolhnikoff 2005, p. 102. ^ Dolhnikoff 2005, p. 103. ^ Dolhnikoff 2005, pp. 110–112. ^ Dolhnikoff 2005, p. 118. ^ Dolhnikoff 2005, p. 83. ^ Dolhnikoff 2005, pp. 118–119. ^ Rodrigues 1863, pp. 134–135. ^ Carvalho 2008, p. 29. ^ a b c Vainfas 2002, p. 223. ^ a b Barman 1988, p. 124. ^ a b c Carvalho 2008, p. 30. ^ a b c Vainfas 2002, p. 139. ^ a b Carvalho 2008, p. 31. ^ a b Carvalho 1993, p. 46. ^ a b c d e Vainfas 2002, p. 224. ^ a b Carvalho 2007, p. 180. ^ Carvalho 1993, p. 48. ^ Carvalho 2008, p. 39. ^ Carvalho 2008, p. 33. ^ Carvalho 1993, p. 51. ^ Carvalho 2002, p. 84–85. ^ Carvalho 2002, p. 91. ^ Rodrigues 1863, pp. 79, 117. ^ a b Carvalho 2007, p. 193. ^ Lira 1977, Vol 3, p. 84. ^ Pedrosa 2004, p. 289. ^ Holanda 1974, pp. 241–242. ^ Vainfas 2002, p. 548. ^ Calmon 2002, p. 265. ^ Parkinson 2008, p. 128. ^ Lira 1977, Vol 3, p. 70. ^ Lira 1977, Vol 3, p. 69. ^ Barman 1999, p. 321. ^ Carvalho 2007, p. 196. ^ Topik 2000, pp. 64, 66, 235. ^ Rodrigues 1975, p. 168. ^ Rodrigues 1975, pp. 174, 177, 180, 181, 182. ^ Rodrigues 1975, p. 148. ^ Vainfas 2002, p. 301. ^ Viana 1994, p. 525. ^ Vainfas 2002, p. 302. ^ Viana 1994, p. 578. ^ Viana 1994, p. 575. ^ Vainfas 2002, p. 329. ^ Vainfas 2002, pp. 323–324. ^ Smith 2010, p. 7. ^ Smith 2010, p. 18. ^ Barman 1999, p. 306. ^ Rodrigues 1995, p. 208. ^ Topik 2000, p. 60. ^ Barman 1999, p. XVI. ^ Graça Filho 2004, p. 21. ^ Sodré 2004, p. 201. ^ Fausto & Devoto 2005, p. 47. ^ Fausto & Devoto 2005, p. 50. ^ Lira 1977, Vol 1, p. 200. ^ Barman 1988, pp. 218, 236, 237. ^ Topik 2000, p. 19. ^ a b Fausto & Devoto 2005, p. 46. ^ Topik 2000, p. 33. ^ a b Vainfas 2002, p. 250. ^ Vainfas 2002, p. 251. ^ Fausto 1995, p. 239. ^ Calmon 2002, p. 368. ^ Vainfas 2002, p. 538. ^ a b c d Lira 1977, Vol 2, p. 13. ^ Vasquez 2007, p. 38. ^ Viana 1994, p. 496. ^ Calmon 2002, p. 222. ^ Calmon 2002, p. 225. ^ Calmon 2002, p. 226. ^ Lira 1977, Vol 2, p. 309. ^ Vainfas 2002, p. 539. ^ Calmon 2002, p. 366. ^ a b c Vainfas 2002, p. 131. ^ a b c d Vainfas 2002, p. 132. ^ a b c d e f g Vainfas 2002, p. 133. ^ a b Baer 2002, p. 341. ^ a b c d e Ramos 2003, p. 82. ^ Coelho 1996, p. 268. ^ Vesentini 1988, p. 117. Barsa 1987, Vol 4, pp. 254–255, 258, 265. ^ a b Moreira 1981, p. 108. ^ Azevedo 1971, pp. 74–75. ^ Barsa 1987, Vol 10, p. 355. ^ Azevedo 1971, p. 74. ^ a b Azevedo 1971, p. 161. ^ Ramos 2003, p. 84. ^ a b Viana 1994, p. 511. ^ Ramos 2003, p. 37. ^ Viana 1994, p. 512. ^ Viana 1994, p. 513. ^ Viana 1994, pp. 513–514. ^ Viana 1994, p. 515. ^ Viana 1994, p. 517. ^ a b c Vainfas 2002, p. 351. ^ a b c Viana 1994, p. 633. ^ Vainfas 2002, p. 353. ^ Vainfas 2002, pp. 351–352. ^ Vainfas 2002, pp. 18, 239. ^ Vainfas 2002, pp. 237–238. ^ Vainfas 2002, p. 29. ^ Boxer 2002, pp. 113–114, 116. ^ Vainfas 2002, p. 30. ^ Boxer 2002, pp. 185–186. ^ Boxer 2002, p. 117. ^ Boxer 2002, p. 206. ^ Boxer 2002, p. 169. ^ Vainfas 2002, pp. 238–239. ^ a b c Vainfas 2002, p. 239. ^ Besouchet 1985, p. 167. ^ Fausto 1995, pp. 238–239. ^ Olivieri 1999, p. 43. ^ Barman 1988, p. 194. ^ Carvalho 2007, p. 130. ^ Alencastro 1997, pp. 87–88. ^ Besouchet 1985, p. 170. ^ a b Vainfas 2002, p. 553. ^ a b c d e f Vainfas 2002, p. 554. ^ a b c Barman 1999, p. 11. ^ a b Viana 1968, p. 208. ^ Barman 1999, p. 139. ^ Viana 1968, p. 220. ^ Viana 1968, p. 216. ^ Viana 1968, pp. 204, 206. ^ Viana 1968, p. 218. ^ Viana 1968, p. 219. ^ Viana 1968, p. 221. ^ Barman 1999, p. 77. ^ Viana 1968, p. 217. ^ a b Schwarcz 1998, p. 191. ^ Vainfas 2002, p. 126. ^ a b c d e f g Barman 1999, p. 254. ^ a b c Carvalho 2007, p. 151. ^ Carvalho 2007, p. 150. ^ Barman 1999, pp. 254–256. ^ a b c Vainfas 2002, p. 450. ^ Vainfas 2002, pp. 450–451. ^ Vainfas 2002, p. 451. ^ a b Vainfas 2002, p. 596. ^ Vainfas 2002, pp. 596–597. ^ Vainfas 2002, p. 31. ^ Vainfas 2002, pp. 114–115. ^ Vainfas 2002, pp. 30–31. ^ Vainfas 2002, pp. 170. ^ a b c Vainfas 2002, p. 83. ^ a b Vainfas 2002, p. 84. ^ Vainfas 2002, pp. 21–22. ^ a b Vainfas 2002, p. 22. ^ Schwarcz 1998, pp. 126–127. ^ Schwarcz 1998, p. 152. ^ Vainfas 2002, p. 285. ^ Vainfas 2002, p. 123. ^ a b Schwarcz 1998, p. 145. ^ Vainfas 2002, pp. 84–85. ^ a b Vainfas 2002, p. 85. ^ Vainfas 2002, p. 482. ^ a b Vainfas 2002, p. 661. ^ Vainfas 2002, pp. 482–483. ^ Barman 1988, p. 237. ^ a b c Vainfas 2002, p. 483. ^ Vainfas 2002, p. 513. ^ a b c Vainfas 2002, p. 484. ^ a b c Vainfas 2002, p. 691. ^ Vainfas 2002, pp. 483–484. ^ a b Vainfas 2002, p. 692. ^ a b Vainfas 2002, p. 693. ^ Vainfas 2002, p. 694. Adas, Melhem (2004). Panorama geográfico do Brasil (in Portuguese) (4th ed.). São Paulo: Moderna. ISBN 978-85-16-04336-0. Alencastro, Luiz Felipe de (1997). História da vida privada no Brasil: Império (in Portuguese). São Paulo: Companhia das Letras. ISBN 978-85-7164-681-0. Azevedo, Aroldo (1971). O Brasil e suas regiões (in Portuguese). São Paulo: Companhia Editora Nacional. Baer, Werner (2002). A Economia Brasileira (in Portuguese) (2nd ed.). São Paulo: Nobel. ISBN 978-85-213-1197-3. Barsa (1987). Enciclopédia Barsa (in Portuguese). 4. Rio de Janeiro: Encyclopædia Britannica do Brasil. Barsa (1987). Enciclopédia Barsa (in Portuguese). 10. Rio de Janeiro: Encyclopædia Britannica do Brasil. Besouchet, Lídia (1985) . José Maria Paranhos: Visconde do Rio Branco: ensaio histórico-biográfico (in Portuguese). Rio de Janeiro: Nova Fronteira. OCLC 14271198. Besouchet, Lídia (1993). Pedro II e o Século XIX (in Portuguese) (2nd ed.). Rio de Janeiro: Nova Fronteira. ISBN 978-85-209-0494-7. Boxer, Charles R. (2002). O império marítimo português 1415–1825 (in Portuguese). São Paulo: Companhia das Letras. ISBN 978-85-359-0292-1. Calmon, Pedro (1975). 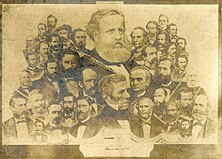 História de D. Pedro II (in Portuguese). 1–5. Rio de Janeiro: José Olímpio. Calmon, Pedro (2002). História da Civilização Brasileira (in Portuguese). Brasília: Senado Federal. OCLC 685131818. Carvalho, José Murilo de (1993). A Monarquia brasileira (in Portuguese). Rio de Janeiro: Ao Livro Técnico. ISBN 978-85-215-0660-7. Carvalho, José Murilo de (2002). Os Bestializados: o Rio de Janeiro e a República que não foi (in Portuguese) (3 ed.). São Paulo: Companhia das Letras. ISBN 978-85-85095-13-0. Carvalho, José Murilo de (2007). D. Pedro II: ser ou não ser (in Portuguese). São Paulo: Companhia das Letras. ISBN 978-85-359-0969-2. Carvalho, José Murilo de (2008). Cidadania no Brasil: o longo caminho (in Portuguese) (10 ed.). Rio de Janeiro: Civilização Brasileira. ISBN 978-85-200-0565-1. Coelho, Marcos Amorim (1996). Geografia do Brasil (in Portuguese) (4 ed.). São Paulo: Moderna. Dolhnikoff, Miriam (2005). Pacto imperial: origens do federalismo no Brasil do século XIX (in Portuguese). São Paulo: Globo. ISBN 978-85-250-4039-8. Doratioto, Francisco (2002). Maldita Guerra: Nova história da Guerra do Paraguai (in Portuguese). São Paulo: Companhia das Letras. ISBN 978-85-359-0224-2. Ermakoff, George (2006). Rio de Janeiro – 1840–1900 – Uma crônica fotográfica (in Portuguese). Rio de Janeiro: G. Ermakoff Casa Editorial. ISBN 978-85-98815-05-3. Fausto, Boris (1995). História do Brasil (in Portuguese). São Paulo: Fundação de Desenvolvimento da Educação. ISBN 978-85-314-0240-1. Fausto, Boris; Devoto, Fernando J. (2005). Brasil e Argentina: Um ensaio de história comparada (1850–2002) (in Portuguese) (2nd ed.). São Paulo: Editoria 34. ISBN 978-85-7326-308-4. Graça Filho, Afonso de Alencastro (2004). A economia do Império brasileiro (in Portuguese). São Paulo: Atual. ISBN 978-85-357-0443-3. Hahner, June E. (1978). "The nineteenth-century feminist press and women's rights in Brazil". In Lavrin, Asunción (ed.). Latin American Women: Historical Perspectives. Westport, Connecticut: Greenwood. ISBN 0-313-20309-1. Holanda, Sérgio Buarque de (1974). História Geral da Civilização Brasileira: Declínio e Queda do Império (in Portuguese) (2nd ed.). São Paulo: Difusão Européia do Livro. Lira, Heitor (1977). História de Dom Pedro II (1825–1891): Ascenção (1825–1870) (in Portuguese). 1. Belo Horizonte: Itatiaia. Lira, Heitor (1977). História de Dom Pedro II (1825–1891): Fastígio (1870–1880) (in Portuguese). 2. Belo Horizonte: Itatiaia. Lira, Heitor (1977). História de Dom Pedro II (1825–1891): Declínio (1880–1891) (in Portuguese). 3. Belo Horizonte: Itatiaia. Moreira, Igor A. G. (1981). O Espaço Geográfico, geografia geral e do Brasil (in Portuguese) (18th ed.). São Paulo: Ática. Nabuco, Joaquim (1975). Um Estadista do Império (in Portuguese) (4th ed.). Rio de Janeiro: Nova Aguilar. Olivieri, Antonio Carlos (1999). Dom Pedro II, Imperador do Brasil (in Portuguese). São Paulo: Callis. ISBN 978-85-86797-19-4. Pedrosa, J. F. Maya (2004). A Catástrofe dos Erros: razões e emoções na guerra contra o Paraguai (in Portuguese). Rio de Janeiro: Biblioteca do Exército. ISBN 978-85-7011-352-8. Ramos, Arthur (2003). A mestiçagem no Brasil (in Portuguese). Maceió: EDUFAL. ISBN 978-85-7177-181-9. Rodrigues, José Carlos (1863). Constituição política do Império do Brasil (in Portuguese). Rio de Janeiro: Typographia Universal de Laemmert. Rodrigues, José Honório (1975). Independência: Revolução e Contra-Revolução – A política internacional (in Portuguese). 5. Rio de Janeiro: F. Alves. Rodrigues, José Honório (1995). Uma história diplomática do Brasil, 1531–1945 (in Portuguese). Rio de Janeiro: Civilização Brasileira. ISBN 978-85-200-0391-6. Salles, Ricardo (1996). Nostalgia Imperial (in Portuguese). Rio de Janeiro: Topbooks. OCLC 36598004. Schwarcz, Lilia Moritz (1998). As barbas do Imperador: D. Pedro II, um monarca nos trópicos (in Portuguese) (2nd ed.). São Paulo: Companhia das Letras. ISBN 978-85-7164-837-1. Sodré, Nelson Werneck (2004). Panorama do Segundo Império (in Portuguese) (2nd ed.). Rio de Janeiro: Graphia. ISBN 978-85-85277-21-5. Vainfas, Ronaldo (2002). Dicionário do Brasil Imperial (in Portuguese). Rio de Janeiro: Objetiva. ISBN 978-85-7302-441-8. Vasquez, Pedro Karp (2007). Nos trilhos do progresso: A ferrovia no Brasil imperial vista pela fotografia (in Portuguese). São Paulo: Metalivros. ISBN 978-85-85371-70-8. Vesentini, José William (1988). Brasil, sociedade e espaço – Geografia do Brasil (in Portuguese) (7th ed.). São Paulo: Ática. ISBN 978-85-08-02340-0. Viana, Hélio (1968). Vultos do Império (in Portuguese). São Paulo: Companhia Editora Nacional. Viana, Hélio (1994). História do Brasil: período colonial, monarquia e república (in Portuguese) (15th ed.). São Paulo: Melhoramentos. ISBN 978-85-06-01999-3.